Maybe it's the follicular pheromones, or the fuzzy feel, but one thing is certain – women love men with beards. In fact, research has revealed the majority of U.S. women prefer a man with facial hair over a clean-shaven face. Something women don't love, however, is the mess a neatly groomed beard can leave behind. So just in time for Valentine's Day, men's grooming leader Wahl is coming to the rescue with the new Wahl Lithium Ion Vacuum Trimmer – a gift he'll want and she'll praise. "Knowing what men want from their trimmer is a priority, but we also dig deeper to find out what the women who live with bearded men think," said Steven Yde, division vice president for Wahl. "Not surprisingly, mess-free trimming is high on their wish list. With this in mind, we think our new Vacuum Trimmer will make everyone happy." Wahl's had a hunch for years, but an online survey from market research leader ORC International confirmed it — the majority of U.S. women prefer a man with facial hair over a clean-shaven face (58 percent vs. 42 percent, respectively). Millennial women showed a particular panache with a 71 percent preference. In general, 65 percent of women find facial hair attractive, and 57 percent describe men with facial hair as masculine or handsome. As far as style, stubble topped the preference list and a well-groomed beard was a close second. While women prefer a well-groomed beard, achieving this look often leaves an aftermath of wayward whiskers in the sink or covering the counter. 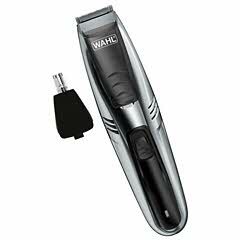 Thankfully, the new Wahl Lithium Ion Vacuum Trimmer is designed with easy cleaning in mind. The trimmer crushes the competition with the highest air velocity in the industry. This translates into virtually all of the hair trimmings being captured — and no more mess. Standard to Wahl, the Vacuum Trimmer doesn't compromise on its grooming capabilities with the power of lithium ion technology, a 90 minute run time, self-sharpening precision blades, LED charge indicator, nine guide combs and the option for corded or cordless operation.